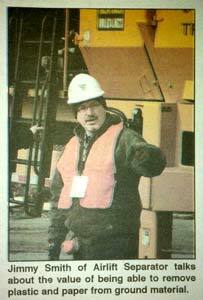 Foley said that he purchased the AL200D, diesel powered unit approximately one year ago. Since then, whenever he is screening material that might contain plastics and other unwanted light-weight material, he attaches the Airlift Separator, and high quality compost and mulch is the result. The Airlift Separator acts like a large vacuum cleaner that typically is mounted on the discharge conveyor of a trommel or as in Foley’s case, an Aggregates Equipment screening unit. For more thorough cleaning a larger, dual fan unit, the AL400D is available which can be used clean both the fines and overs on screener’s conveyors if that is the desired configuration. In any case, the Airlift Separator removes plastics and other lightweight material from compost and mulch without slowing down production. A look in Foley’s discharge bin gives an idea of the kind of unwanted material this system can remove. 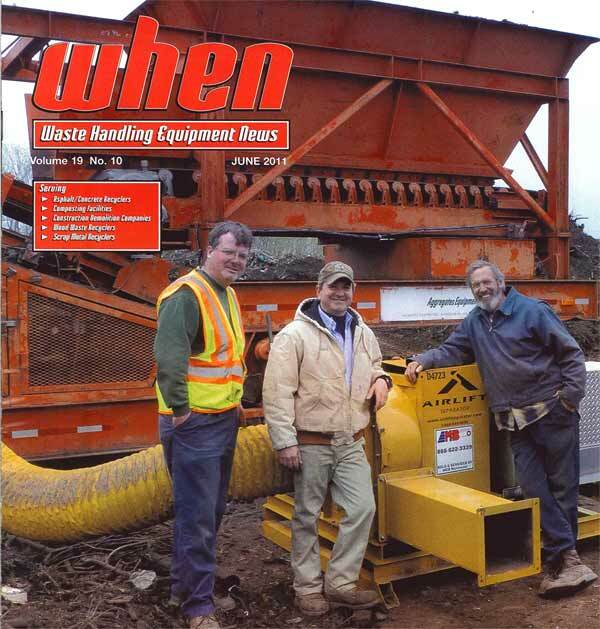 [From the July 2011 issue of When Magazine] At a demonstration of an Airlift Separator, Jimmy Smith showed how mulch laced with unwanted plastic and paper can be screened with ease using a model AL400D Diesel Powered unit mounted to a Wildcat 516 Trommel Screen. Smith explained that recyclers and composters are always looking for ways to remove the unwanted plastic and paper that somehow always seems to make its way into mulch. For recyclers who are looking to produce a value added product such as composted soils or high quality, plastic-free mulch. 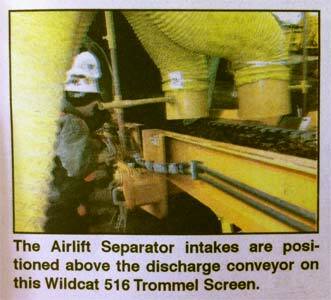 The Airlift Separator is the ideal tool for the job. More importantly, the Airlift Separator comes in four configurations that include diesel, hydraulic and electric powered models in two sizes.